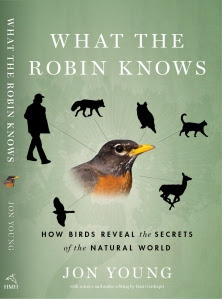 What The Robin Knows and Animal Orchestras! Here are some books that are on my "To Read" list - some very interesting studies on bird and animal sounds! I remember reading about how urban birds have been heard to sing at a different octave or range than their country "relatives" to be able to be heard through the urban noises! This book describes a "deep bird language (which) is an ancient discipline, perfected by Native peoples the world over. Finally, science is catching up. This ground breaking book unites the indigenous knowledge, the latest research, and the author's own experience of four decades in the field to lead us toward a deeper connection to the animals and, in the end, a deeper connection to ourselves." (description from Amazon). Roadside Field Notes also commented on some interesting bird interaction in their post: Cardinals countersing! Ever since I saw the daylighting project that Ecocity Builders did in California, my dream has been to be part of a team that daylights a stream. This type of work doesn't happen too much. As in the Ecocity Builders project, a parking lot was being decommissioned so there was an opportunity. 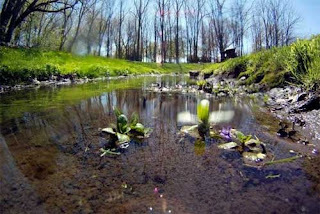 What daylighting entails is taking a stream that has been routed underground (through pipes) and reintroducing it at ground level, which means you have to have the area/space to allow the stream to burble and gurgle across a stream bed, through rocks, around bends and along a stream bank. Ultimately this means more green and less grey (yeah!) but it's hard to redesign a space and take away infrastructure if it is needed. I was talking to a teacher at the end of the semester about my dream to daylight and how it is very hard to find potential projects and all of a sudden it came to me - the opportunity in Detroit - so many empty properties, so much change... so I googled for it and found that other people are realizing the how promising their situation could be: Detroit Officials are looking into "daylighting" Bloody Run Creek. There was also this link to a Masterplan Memorandum about the potential for Urban Stream Restoration in Detroit: which "provides a description of urban stream restoration, identifies the benefits and challenges to restoration and the application of this information to a specific area in the City of Detroit. And here's a Mahalo article about Daylighting Streams that provides an example of a completed project. Labels: restoration, urban stream/creek, visit U.S.
By now I'm sure you've heard about the Emerald Ash Borer beetle. It seems that this beetle just can't get enough of our ash trees! The changes to our cities, because of the destructive action of this beetle on ash trees, could be large. Ottawa itself is predicting the loss of almost one-quarter of Ottawa’s tree cover unless something is done. This truly would alter many streetscapes and bring down neighborhood real estate values, as our stately tree cover and lovely tree-lined avenues are lost. Across the province, different cities are taking various approaches. The City of Oakville is taking a multi-layered approach that includes treating 7000 trees on public property and encouraging residents to save ash trees on private property. "One in 10 of the town’s trees are ash — roughly 180,000 and 80 per cent of salvageable trees are growing on private property." 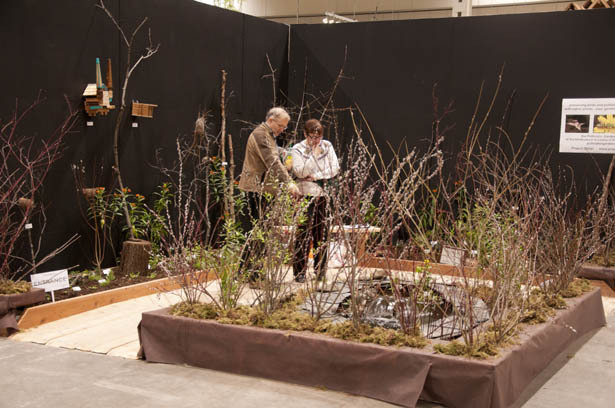 Learn more about their “Canopy Club” and check out the videos the town created that show the use of TreeAzin, which can help prolong an infected trees life at this BioForestTech link. Here is a great article by LEAF (Local Enhancement and Appreciation of Forests) on the TreeAzin Insecticide. The City of Toronto, York Region and the Town of Markham are providing funding support to the non-profit LEAF to train EAB Ambassadors. These ambassadors will help spread the word in their neighborhoods about treatment options for ash trees not yet infested, replanting programs and more. There are approximately 860,000 ash trees in the City of Toronto and an estimated 2,800,000 mature ash trees growing in York Region. Trees, particularly those in an urban setting, are a critical asset vital to the whole community. Whether beautifying our streets, shading our parks or enhancing our property, trees improve air quality and health, save us energy costs, add to the enjoyment of our home and increase the resale value of our property as well as the desirability of our neighbourhood. Trees add to the beauty, liveability and image of a city. There has been a lack of community consultation regarding the City's strategy and large number of trees are being cut without any consideration of alternatives. Is the City moving ahead too quickly and are there questions that should be asked? Ottawa is primed to cut 75,000 trees down, which could cost up to $100M over the next number of years - are there alternatives that would be less costly and less drastic? My friend sent me a link to Project CHIRP! 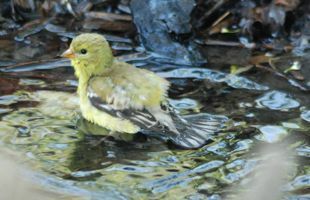 (which stands for “Creating Habitat in Residential Areas and Parkland), which is a conservation initiative to help "inspire homeowners to incorporate native flora into their gardens to support songbird populations". Christina and Richard offer a “site consult” service to address site-specific concerns and assist with the creation of a basic site map, noting such things as garden dimensions, permanent structures, beneficial vantage points, sun exposure, microclimates and soil type. The fee for this service is about $50. To learn more about Project CHIRP! 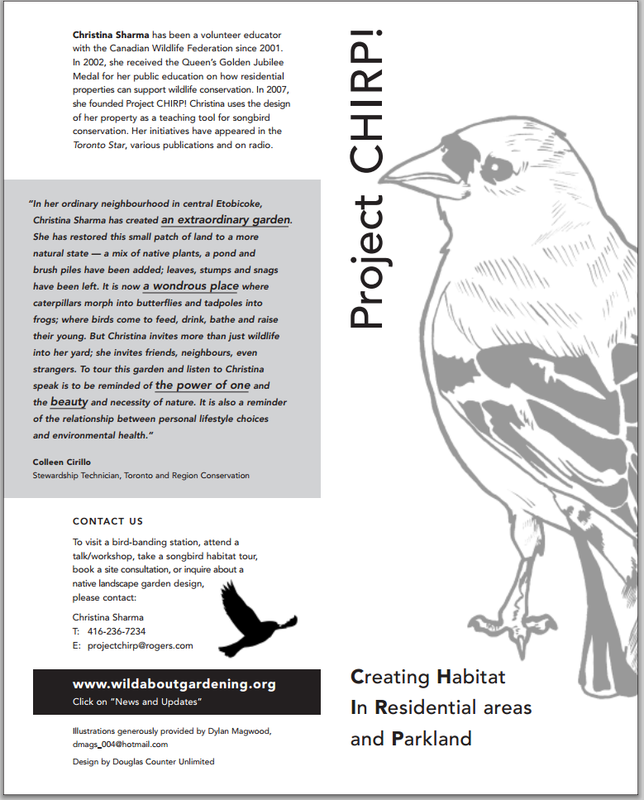 and upcoming songbird garden tour dates, bird banding station visits, speaking events or home site consults/native garden design, contact Christina at projectchirp at rogers dot com or 416.236.7234." "The book launch will take place at the beginning of the lecture Miraculous Migrants: Why Songbird Conservation Begins at Home, delivered by Dr. Bridget Stutchbury of York University and Christina Sharma of Project CHIRP." 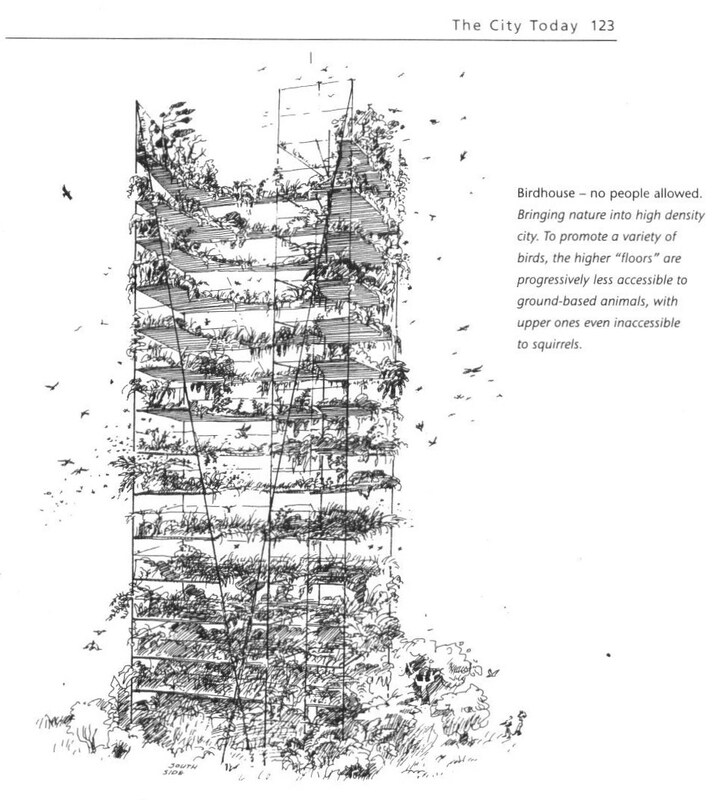 Image from Richard Register's ecocities - Rebuilding Cities in Balance with Nature. While the book focuses more on urban design, sustainable transportation and energy alternatives, there are some brief mentions of design to support nature. 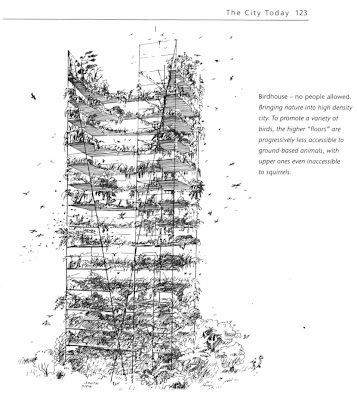 I loved this image (from page 123) showing a "birdhouse" in the city - a skyscraper designed for birds only (no people allowed)! Those two "dots" down in the right hand corner? Two people amazed by the building!